reported that a new round of scientific whaling by Japan during the austral summer of 2017-18 yielded a catch of 333 minke whales, but that of this number 122 were pregnant females and 114 were considered immature individuals . The news invited and perhaps stoked outrage, which history shows can be a powerful force shaping environmental law and policy. Japan took the whales pursuant to a scientific research exemption to the moratorium on commercial whaling enacted by the International Whaling Commission (IWC) and effective in 1986 . The first research program under which Japan continued whaling in the Antarctic despite and perhaps in defiance of the moratorium, a program known as JARPA-II, was found in a 2014 decision of the International Court of Justice not to meet the terms of the scientific research exemption allowed under the International Convention for the Regulation of Whaling . Japan then developed a different scientific rationale for taking whales in the Antarctic, known as NEWREP-A. It’s unclear whether the lethal sampling authorized by the permit issued by the Japanese government to pursue NEWREP-A is necessary for Japan to realize what it claims under international law are its legitimate scientific objectives. But if that is not the case then presumably at some point, if it is appropriately challenged, NEWREP-A could be found to be as illegal as JARPA-II . But underlying the persistent questions about whether Japanese whaling in the Antarctic is legal in some narrow sense, based on a close reading of the relevant international law, is a prior and much larger and much more profound question. It asks whether Japan’s Antarctic whaling is a legitimate continuation of what in 2002 the director-general of the Institute of Cetacean Research (ICR), the entity that is the chief proponent and enabler of continued Japanese whaling, told an international conference was “a tradition of whaling which (Japan) has built up over nine thousand years.” Japan, he said, has believed so firmly and for so long in the sustainable use of whales as a food resource that she could never give up such a deeply rooted and integral cultural tradition . This line of argument did not persuade the IWC to grant Japan an aboriginal (subsistence) whaling exemption to the moratorium. The theory, then, on which Japan rests its case is that more scientific research, undergirded by the lethal taking of whales, is needed to establish the sustainable level of whale harvest that would justify lifting the 1986 moratorium on commercial whaling. Since the rules for whaling under a scientific research exemption from the 1986 IWC moratorium do not allow lethally sampled whales to be wasted, ICR passes the meat left over, once data are collected from dead whales, to an associated company that then tries to sell the meat . If the validity of a sustainable take were ever to be established beyond a reasonable scientific doubt, the theory further holds that Japan would be able to resume commercial whaling in conformity with the 1946 International Convention for the Regulation of Whaling, which entered into force in 1948. Perhaps other countries that have given up whaling since the 1986 moratorium went into effect would do the same, although most observers of the IWC would consider that very unlikely. If Japan’s theory is ever to translate into practice, then much obviously depends not only on the scientific validity of Japan’s NEWREP-A research program but also on the legitimacy of the claim that eating whale meat has become so integral to Japanese identity that its legal prohibition would constitute an unwarranted act of cultural discrimination and deprivation. So, against this background, what is the real history of whaling in Japan? Is it first and foremost a story about the continuation of a centuries old cultural tradition? And how likely is it that the whaling Japan continues to do in the name of scientific research under IWC rules will validate a long-standing dedication to the sustainable use of whales for food? A harpooner from a net whaling group trying to deal a death blow with a long-handled knife to a whale wounded by harpoons and lances. Courtesy of the National Diet Library of Japan. Comes now Jakobina Arch with a new book to provide for the first time convincing answers to these and other questions in Bringing Whales Ashore: Oceans and the Environment of Early Modern Japan (Seattle: University of Washington Press, 2018). This is not the place to essay a full review. But in the context of a blog post let me make three observations, following the lead of Paul Sutter, now the series editor for Weyerhauser Environmental Books and the author of a Foreword to Arch’s book. I hope they entice readers to read the book carefully. The first important point to take away from this book is that there was no organized whaling in Japan before the late sixteenth century. There was before that time and probably going back to prehistoric times some opportunistic use of stranded whales. 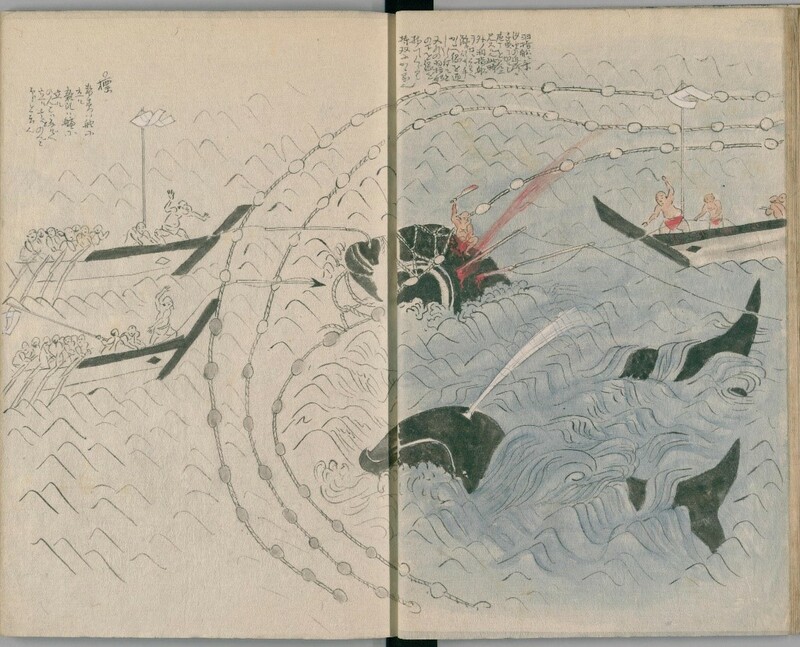 But the organized, systematic hunting of whales, a capital and labor-intensive activity in which large numbers of Japanese worked in groups in coastal villages to harvest near-shore whales for profit, dates from the Tokugawa period of Japanese history (1603-1868), a period in which the internal peace achieved and overseen by the Tokugawa shogunate led to dramatic and unprecedented population increase in the seventeenth century and to a consequent search for new resource strategies. Organized whaling was one of those strategies, one that Sutter observes was distinctive to the Tokugawa period and highlighted the importance of the near-shore marine environment to the environmental history of that period [p. xi]. Later, after the Meiji Restoration (1868-1912), the character of whaling in Japan was again transformed, with changes in the techniques employed, the whale populations targeted, and the equipment, locations and numbers of people involved. Japan belatedly turned to pelagic ship-based hunting and processing of whales, “using the same engine-driven ships out in the open ocean, with bow-mounted harpoon guns, that other whaling nations like Norway and Britain were using” [p. 186]. But this is all evidence for disjuncture and discontinuity in the history of Japanese whaling, not for an unbroken cultural heritage of whaling that is in danger of extinction unless the IWC moratorium is lifted. Tacey Rychter, “122 Pregnant Whales Were Killed in Japan’s Latest Hunt. Was This Illegal?” New York Times, 30 May 2018. The report of research results is contained in Takeharu Bando et al., Results of the third biological field survey of NEWREP-A during the 2017/18 austral summer season, (International Whaling Commission, Cambridge, England, 2018). The moratorium on commercial whaling was agreed to by the IWC in 1982 and became effective in 1986 as an amendment to paragraph 10 of the Schedule to the International Convention for the Regulation of Whaling. The Schedule, which can be amended by the IWC at its biennial meetings, sets out the rules under which the Convention is implemented. Paragraph 10(e) reads as follows: “Notwithstanding the other provisions of [this] paragraph, catch limits for the killing for commercial purposes of whales from all stocks for the 1986 coastal and the 1985/86 pelagic seasons and thereafter shall be zero. This provision will be kept under review, based upon the best scientific advice, and by 1990 at the latest the Commission will undertake a comprehensive assessment of the effects of this decision on whale stocks and consider modification of this provision and the establishment of other catch limits.” The full, amended text of the Schedule is readily accessed from the IWC website. The web portal for access to all the relevant legal documentation for the court’s holding in Whaling in the Antarctic: Australia v. Japan (New Zealand intervening) is here. Australia may be reluctant to challenge the legality of NEWREP-A for fear that it would provide an opening for a court contest over Australia’s claim to Antarctic territory and more specifically to its declaration of an Australian Whale Sanctuary in waters adjacent to the Antarctic territory that Australia claims. Quoted in Jakobina Arch, Bringing Whales Ashore 4, from a report of the proceedings of the 1st Summit of Traditional Japanese Whaling Communities held in Nagato in 2002 and published in 2003 by the Institute of Cetacean Research. 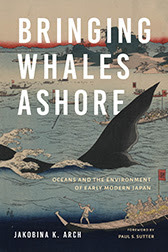 The unexamined assumption that Japan has always hunted whales for food appears in some of the most serious and ambitious scholarship in English about the law and politics of the IWC regime, as when Robert Friedheim flatly states that “Japanese whalers were mostly interested in hunting whales for food” (Robert Friedheim, ‘Introduction: The IWC as a Contested Regime,’ in R. Friedheim (ed. ), Toward a Sustainable Whaling Regime 30), in apparent reliance on Hugh Borton, Japan’s Modern Century 13. The question of whether there is a viable market for whale meat in modern Japan is controversial, as is the question of whether some of the whale meat Japan acquires through its scientific research programs finds its way illegally into other countries. The factors at work are described in Akiko Ishihara and Junichi Yoshii, A Survey of the Commercial Trade in Whale Meat Products in Japan (TRAFFIC East Asia-Japan, 2000). See also section VI of C. Scott Baker and Merel Dalebout, ‘Forensic Genetics,’ in William Perrin, Bernd Würsig and J.G.M Thewissen (eds. ), Encyclopedia of Marine Mammals, 2nd ed. 453-458.